The best organizations cultivate their leadership internally. Being able to hire people, lift them through the ranks, cultivate their best traits, and help them on their way toward becoming a highly valued leader within your organization. Being able to cultivate leadership internally starts with training. Some individuals will have a personal makeup that simply makes them more suitable for leadership positions. However, no one comes to your company completely ready to take on a leadership role. Everyone needs time to build their skills, learn, and put themselves in practical practice situations to try those new skills on in a business setting. With Baby Boomers retiring, its more important than ever that organizations are able to replace them with qualified, competent individuals. You’ll find most of your success in recognize leaders internally by making a point to identify them early. Making it a priority to identify entry-level employees that have shown the potential to be leaders can help you to elevate them when the time calls for it. Additionally, you can put extra work into retaining them as they field other offers throughout your industry. Identifying them early will allow you to start training them early. It doesn’t have to be overt. 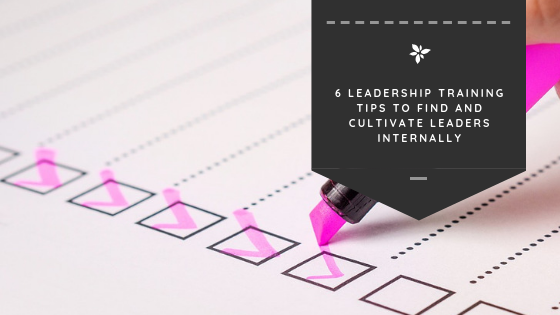 It could be as simple as making sure that they are included in some of the leadership skills building events and activities and taking a personal interest in them. Institute programs for lower level employees that want to build higher level skills within your organization. Giving your employees options to attend additional trainings, improve their education, or find mentors within your organization can be helpful. Don’t try to force it. Just because you see leadership potential in someone doesn’t mean that they see it within themselves. If they don’t want to take part in the trainings or have that desire to move up the food chain, then you might want to start looking in another direction. Focus on those that are eager and willing to learn and express a desire in receiving further training. Even if they don’t possess all of the qualities of a leader in the short-term, the fact that they express interest in learning more means they will be more likely to down the road. Additionally, they’ll be open to instruction and display a willingness to learn. With this tip, we are again attempting to avoid trying to fit a square peg into a round hole. When you identify candidates that you like for leadership positions, don’t push them in a certain direction against their will. Even if that direct works to the benefit of the company. Let’s say a team lead position was expected to open up in the next year — it might seem logical to push them toward that position. But maybe they have other ideas. They might want to go in a different direction. Maybe they want to switch departments. Maybe they have always wanted to take a leadership position for a specific product. Work with them to identify where they would most like to go so that you can keep them motivated and interested. If you want to cultivate leadership, you have to train your employees for those positions. Too many companies are simply just hoping that specific members of their workforce rise above the rest without properly investing in their professional development. Then they are disappointed with the results. Instead, make a commitment to investing in the professional development of your teams early on in their careers. From the time that they get settled into their position, there should be options that they can choose from to hone their skills and build a better career. Use your employees as a resource. Ask them what they would like to learn about. Determine which topics are most important to them. Then use their responses to determine what programs might be the best fit for a majority of your workforce. Failing to offer regular training opportunities can make your employees feel like their professional lives have become stagnant. You’ll see your retention rates tick down, and fewer employees actively pursuing internal growth. From the moment that you hire someone, you should have a mentor working with them to ensure that they are setting goes for their future within the organization. If you want to make it clear to your employees that they will have opportunities to move up internally, you need to get them thinking about that future early on in their employment. Every new hire and employee should be setting and resetting goals every year. This will help to keep your organization forward thinking and also give you insight into where each employee within your company would like to go. Remember — career planning goals are different from the goals that your teams set internally as they apply to their job. Career planning takes a longer view of where employees would like to be in relation to their position within the company. Want to know how you can get your employees to aspire to higher positions within your organization? Show them that it is not just possible, but likely that they are able to move up if they dedicate themselves to it. Make sure that you are regularly promoting from within. The more that they see it happen, the easier it will be for them to see themselves in a similar position. 65% see opportunities for advancement as another essential component of a good job. Cultivating leadership isn’t something that any organization can do. It requires a dedicated strategy. Your team needs to put in the effort to identify top-line candidates and fast-track them into programs that will meet their needs. But — it’s also a collaborative process. Your employees will only be excited to move up the ladder if it’s the direction that they would like to head.